Left: TsA201-cells expressing the neuronal calcium release-controlling protein IRBIT (green) as well as markers for the endoplasmic reticulum (red) and cellular membranes (blue). 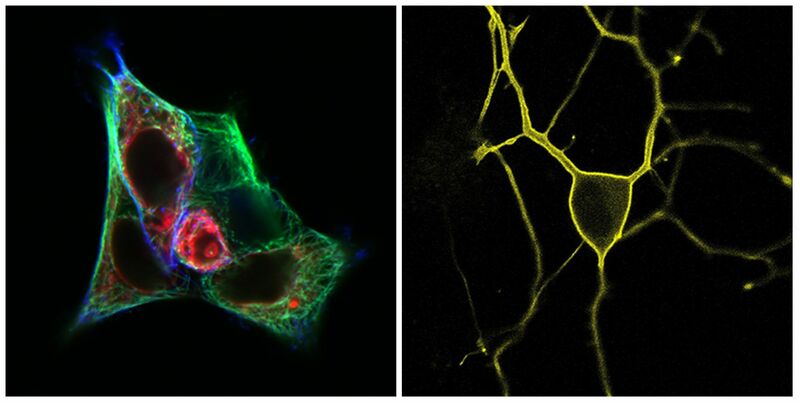 Right: A hippocampal neuron expressing a yellow fluorescent protein marking membrane areas containing the neuronal activity-regulating phospholipid phosphatidylinositol 4,5-bisphosphate. My research is centered around the question how cells of the nervous system regulate their activity. Neurons are permanently exchanging information, and their activity patterns change in milliseconds; however, our understanding of the processes underlying these rapid changes in neuronal activity is still limited. During the last decade, a small class of phospholipids named phosphoinositides has emerged as a key regulator of most aspects of a neuron’s life, and the levels of specific phosphoinositides as well as their localization in a nerve cell profoundly influence neuronal signaling. I am using a combination of genetic, biochemical, electrophysiological, and computational approaches to characterize the multiple roles phosphoinositides fulfill in nerve cells. Kruse M., Vivas O., Traynor-Kaplan A. and Hille B. (2016) Dynamics of Phosphoinositide-Dependent Signaling in Sympathetic Neurons. J. Neurosci. 36(4): 1386-1400. Keum D., Kruse M., Kim D.I., Hille B. and Suh B.C. (2016) Phosphoinositide 5- and 3-phosphatase activities of a voltage-sensing phosphatase in living cells show identical voltage dependence. Proc. Natl. Acad. Sci. 113(26): E3686-E3695. Kruse M., Hammond G.R. and Hille B. (2012) Regulation of voltage-gated potassium channels by PI(4,5)P2. J. Gen. Physiol. 140(2): 189-205. Kurtbay, Güven 2009. Impaired endocytosis of the ion channel TRPM4 is associated with human progressive familial heart block type I.